Gaucho’s Edinburgh location is a homecoming for the restaurant’s free-to-roam, grass-fed Aberdeen Angus beef. Originally from Scotland, Aberdeen Angus was first introduced to Argentina in 1879 by Don Carlos Guerrero. Today, all Argentina’s Aberdeen Angus are direct descendants of Guerrero’s original Scottish cattle – Cinderella, Aunt Lee and Virtuoso, the bull. Always a friendly welcome and dogs are normally offered a bowl of water before you are asked if you want a pint! Lovely and warm on a cold night. 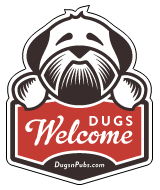 Pub Fact: The Wally Dug was runner up in the vote for Favourite Dog Friendly Place of 2013. There are a total of 26 dog friendly listings in the New Town Pubs category. Please log in, or sign up as a member to view all listings.